A number of developers and other users who have been updating to iOS 9 beta 2, which was released earlier today, have found a great new feature of the software. 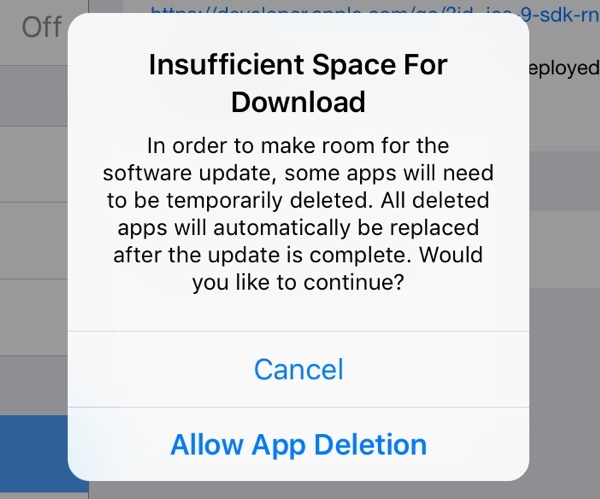 If there’s not enough room on your iOS device during an update, you can select to temporarily delete some apps to free up enough space. After the update, those apps will automatically be reinstalled on your device. Just to clarify, this won’t make it any easier to update from iOS 8 to iOS 9 when it officially arrives sometime this fall. But it will help when updating from iOS 9 and beyond, which should definitely be great – especially if Apple decides to somehow continue selling devices with just a measly 16GB of storage. The iOS 9 itself upgrade will only take up 1.3GB on your device, which is a big change from the 4.53GB needed with iOS 8. Slower than normal iOS 8 adoption rates were partially blamed on many users not having enough free space to upgrade. If you’re suffering from a lack of storage space now, take a look at our own handy guide that offers a number of tips to free up space on your iPhone or iPad. Some of the other changes in the updated beta include revamped icons for the Podcasts and Clock apps and a few minor keyboard tweaks for iPad users. The Apple Watch app is now simply named Watch. 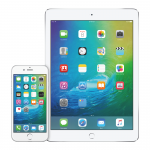 A public beta version of iOS 9 should land sometime next month. For other news today, see: Earn, save and sell with 5 helpful apps, See your entire keyboard at once with MySpecialKey, and You can now jailbreak iOS 8.3 using TaiG.